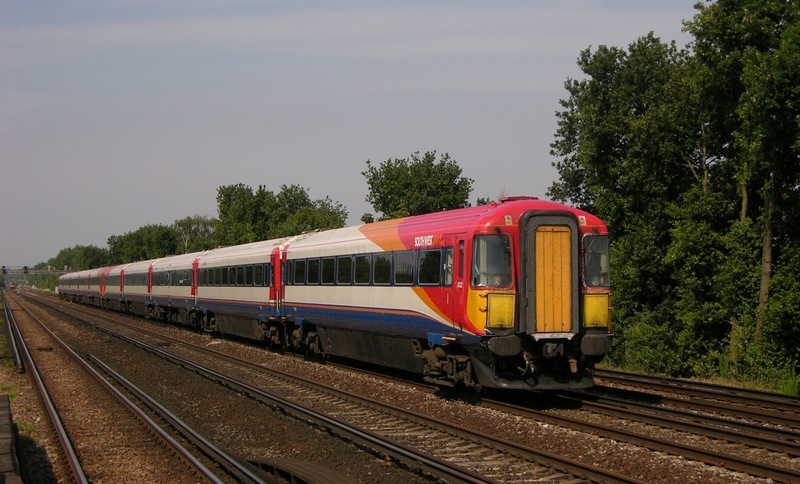 Trains Today: Comment: Where next for the 'Wessex Electric'? Comment: Where next for the 'Wessex Electric'? Back on 2nd July 2006 'Wessex' unit 2422 'Operation Overlord' is leading a 10 car SWT service to Waterloo through Hersham. The days of class 442's working the premium 'Gatwich Express' service is now drawing to a close with news that the first class 387, which will take over from the class, is now in testing and due for delivery before the end of the year. Of course the class was never built for this work, which it is most unsuitable for. 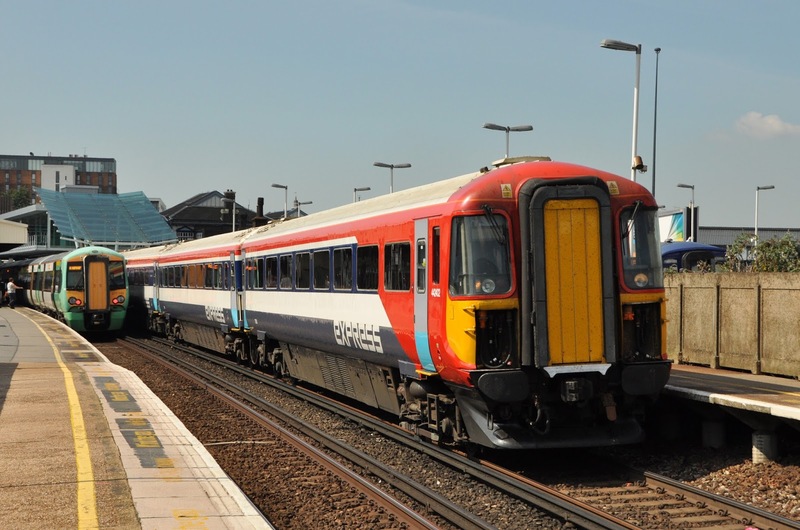 The 24 'Wessex Electrics' spent the first 19 years of their lives working services from Waterloo to Weymouth before being replaced by the newer class 444 'desiro' units. Once retired from Gatwick Express use there will be 24 five coach Mk3 build third rail intercity EMU's up for grabs. They will be a few years shy of their 30th birthday- but what could be next for these units, once described as the most comfortable in all of South East England? Gatwick Airport to Victoria service in August 2012. Further use in the South East on the 3rd rail system would be the obvious option- but there is scarcely any demand for these 'intercity' spec EMU's. Just looking at the recent order books of the London commuter TOC's reveals that the 442 just isn't the type of train being ordered today. Orders instead are for high capacity people movers such as the new class 700 for Thameslink and high capacity class 387's for Southern. Could there be any chance that the 442's may revert to the one line that might still be suitable for them- their old stomping ground from Waterloo to Weymouth? This is a possibility that cannot be totally ruled out but the author feels it very unlikely. The more modern class 444's are now well settled on this route and provide a slight increase in capacity over the 442's- further more displacing the 444's back to the Portsmouth Line where they started life would create a dramatic cut in capacity over 12 car class 450 trains which work many busy commuter services on this line (despite the complaints of some Portsmouth Line commuters!). The extra units could surely be used in the South West, but interoperability issues would also be an issue. Currently most Weymouth services split or divide at Bournemouth. Throwing class 442's into the mix with the newer class 444's would need a new look at the timetable to keep the fleets seperate. The only way I could see 442's having a place back on Weymouth trains would be if the power was finally upgraded to allow 10 car operation to Weymouth- at which point splits at Bournemouth could be removed and 10 car trains could run all the way through to Poole and Weymouth. Right now this seems unlikely. Maybe new innovative 'growth' services could utilise the 442's? The Swanage railway will shortly be re-connecting with the national network at Wareham. 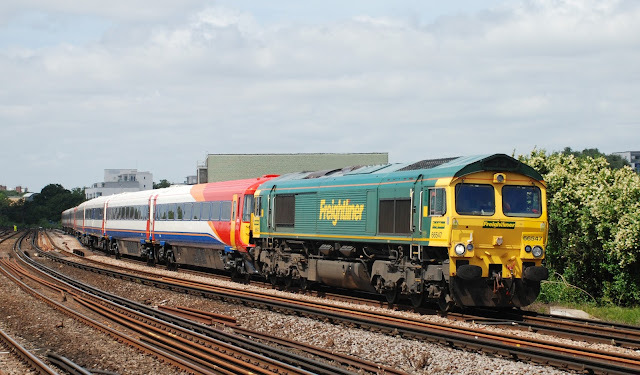 The line has ambitions to once again connect the south coast town of Swanage with the mainline rail network- could a number of 442's be used to connect Swanage with destinations further afield? The heritage railway has several class 33's which can haul the 442 units when off the 3rd rail with the trains continuing on electric power beyond Wareham. A London to Swanage service would surely be the icing on the cake for the town and re-establish a through service which has not regularly run since 1969! Other options avoiding London could also be explored- maybe a train from Brighton to Swanage right along the South Coast? while working a stock transfer from Eastleigh where the units had been in store. Looking further afield it seems the most likely new home for the 442's could be well away from the 'juice' where they have spent all their lives. The North of England is suffering from an acute shortage of DMU's and new orders are thin on the ground as eventual electrification is the preferred option to upgrade lines and replace stock. One network where the capacity crunch is being particularly felt is Transpennine. Currently services are in the hands of class 185 DMU's running largely as single 3 car sets. These are routes where a 5 coach intercity unit would be ideal- especially if it was at relatively low cost. Could this be the perfect place for the class 442's to operate as hauled stock? The 5 car Mk3 build units are at least as comfortable as the class 185's and would allow strengthening of many Transpennine services with a huge increase in capacity. Sadly it would not be class 33's hauling the 442's but most likely a modern locomotive- class 67 or 68 would seem to be most preferable. With the 30, 1999 build class 67's seeking work this could surely be the perfect coupling of spare resources to meet a capacity need. As another advantage this option would render much of the electrical traction equipment- recycled from 4REP units dating back as far as 1966- obsolete. With the 442's becoming spare over the next year only time will tell what fate befalls them next. I cannot help but feel these units are just too good to be scrapped yet- and after all this is the rail industry- one surprise seems to be just round the corner from the last!